Use your workplace fund raising campaign to encourage support for your workforce development strategies. 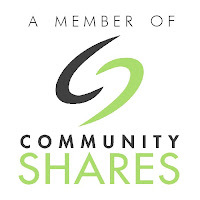 Visit Community Shares of Illinois and learn more about workplace giving campaigns. I attended a workforce development conference at the Federal Reserve Bank yesterday. It was hosted by leaders of the Manufacturing sector, the Chicago Chamber of Commerce, the Swiss-American Business Council and ThinkSwiss, Switzerland's US wide program on education, research and innovation. The conference's focus was on the challenges that manufacturing companies have in finding skilled workers for well paying jobs and careers. Too many kids are choosing college paths that leave them with a degree and four years of debt when they graduate, but no particular skills or job prospects, while at the same time hundreds of companies can find enough workers to fill open jobs. Not enough kids think of manufacturing careers as something they want to go into. Too many parents think college is the only path. I attended this conference a year ago and I wrote about it here and here. If you read many of my past articles you'll see that I believe that volunteer-based tutor/mentor programs like Cabrini Connections can be places where kids meet adults who influence their career aspirations, and where they build skills that make them more desirable for companies. As one executive said, "It's what is modeled for youth", meaning kids are influenced by the careers modeled by the adults in their lives. True. A tutor/mentor program is a place in a high poverty area that connects adults from many different careers with youth who have too few positive career influences, and too many negative models. There are not enough of these programs, and too many struggle to find the dollars needed to operate. This is where the annual workplace fund raising campaigns organized by many companies, the United Way and Community Shares of Illinois come in. A business can promote workplace giving to its employees, and if they include tutor/mentor programs on the list of choices, they can build a stream of employee dollars to make these programs available. If they also encourage employees to serve on boards, be volunteers, or offer talent to help with technology, marketing, accounting, etc. they can build a connection between their company and hundreds of tutor/mentor programs in Chicago and other cities. Thus, instead of pointing to the government, or the public schools, to solve a workforce development crisis, companies should think "out of the box" and begin to support direction connections between themselves and youth. As one leader at the workforce development conference said, "We have to reach out to untapped resources. We can not enter the 21st century with 50% of our students not prepared to be employed." This means that if manufacturing, health care, hospitality, technology and other industries who face workforce shortages encourage the growth of volunteer-based programs, and share ideas like these posted on the Reference Guide to Manufacturing Careers and Training Resources, they can influence the aspirations and career choices of kids in poor neighborhoods who have great natural abilities, but few coaches and mentors to help them optimize these abilities. The urgency of the future should be motivation for leaders of the present to adopt these ideas before it is too late. Ever wonder how we ended up with a grade system in schools and universities? George Siemmens, who hosts the eLearning Space Blog, included this question in his email newsletter. It show how mentors were key to learning in the years befor our current system of public education was developed. I think mentors are still key to learning, and we need to find a delivery system that helps more mentors connect with more kids, especially those living in big city neighborhoods with concentrated poverty, where the range of people who can mentor jobs, careers, college and other aspirations is limited. In the field of elearning, I consider George to be one of my mentors and if have benefited greatly from the ideas received from him over the past few years. Yesterday the lead editorial in the Chicago SunTimes was "Save money and futures: Get dropouts into school." This was an endorsement of a state task force report calling for a statewide system of re-enrolling dropouts that would return 25,000 teens each year to comprehensive alternative high school programs. The cost could be $99 million a year when all 25,000 slots are added. I've written about the high school drop out crisis in past articles. I've also pointed to research by people like Dr. James Heckman, a Nobel winning economist from the University of Chicago, who shows that sustained investments in disadvantaged children would have dramatic results, and that programs that invest at later years, not only cost more, but have less impact. Thus while I agree with the concern for the 25,000 youth who have dropped out, I urge the SunTimes and others to advocate for a public and private sector funding strategy that supports kids from preschool to first job, with a variety of tutoring, mentoring, social emotional, arts and learning programs, available in non school hours and locations, not just in schools. If we prevent more of these teens from dropping out in the first time, we reduce the problems we face later on. The Chicago SunTimes has created a web page showing locations where kids have been killed in the past year. As you view this I encourage you to look at the Tutor/Mentor Connection's zip code map, the see if there are any volunteer-based tutor/mentor programs in these areas who you could help as a volunteer, donor, business leader. If you see a neighborhood with few programs, or where there are few programs for specific age groups, like teens, for instance, you can use the information on the Tutor/Mentor Connection web site to help create new programs. Or if the program in an area is not as well developed as programs in other parts of Chicago, or in other cities, you can offer your time, talent and dollars to help these programs. They cannot do it alone, and without the resources provided by volunteers and donors. I hope you'll bookmark these sites so that every time you read about a shooting, or a poorly performing school, or a workforce development issue, you'll visit these sites to see if there are any programs working to help kids in specific zip codes, and to see what role you can take to help every neighborhood have a full range of great programs helping kids stay safe, and stay headed to jobs and careers. I encourage you to read this article, written on Diane Palumbo's Homework Help Today blog. This is an example of the type of advocacy and leadership I hope will emerge from many business sectors in all parts of the country. I use maps like this to illustrate the needs of kids in areas of highly concentrated poverty are different than the needs of kids in more diverse, and more affluent areas. It's not that kids in all economic strata don't have learning needs, or a need for extra adults in their lives. It's that kids in poverty have less access to these resources. Take tutoring for an example. I live in Park Ridge, Illinois just outside of the city limits. I moved their in 1988 before I left my corporate job. It's a community with many affluent families, and great schools. However, kids need help, and some go to professional tutoring services, where the fees can be $90 per hour and higher. The really sophisticated tutoring services, have diagnostic services that can identify learning problems, and prescriptive services that can help kids overcome those programs. Many of the kids coming to these services are motivated to learn, and the tutor has the professional skills needed to help them overcome their problem. After a short while, it's expected that the youth will be able to progress on his/her own without the help of the high priced tutoring service. 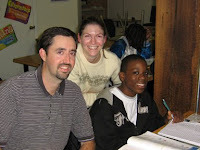 If a student lives in inner city Chicago, he may be motivated, and may need the same type of tutoring help, but he may not have the family income to purchase this type of tutoring, which by the way, is far more professional than most of the NO Child Left Behind tutoring that might be offered. Teachers will tell you, that their main learning hurdle for many kids, is a lack of aspirations, and lack of motivation. They come to school unprepared to learn because they don't have many people in their own family or community who have the same history of learning and achievement as do families in Park Ridge and other affluent areas. Thus, these kids need mentoring and other activities that help build aspirations and motivation, and they need tutoring that can help them build learning habits, overcome learning obstacles, and help them stay on task with homework and school projects. This is what a tutor/mentor program like Cabrini Connections tries to provide, and one of our biggest challenges is finding the dollars to fund the staff, rent and other costs of operating this program. A second is finding volunteers who will stick with this long enough to build their own relationships with kids, and their own personal skills in tutoring and mentoring. That's why I was really pleased to be contacted this week by Diane Palumbo who writes a blog for students and tutors, title Homework Help Today. Diane recognizes that the for-profit tutoring world is making money from their services and could use this money, and the volunteer talent of their members, to support the availability of volunteer-based tutor/mentor programs in high poverty areas. We've agreed to try to work together and Diane is drawing from the ideas on my blog, and writing articles on her blog, to reach out to members of the professional tutoring world to build support for our efforts. I hope that others in the non-school education industry will copy her efforts and support us and similar organizations in cities all over the country. Thank you Diane. Ready for College--How are we doing? "One-third of high school graduates require remedial studies once they get to college" is the lead sentence in a challenging article posted today on the Smart Communities blog. "If we are losing one-third to high school dropouts and another one-third of those that actually graduate and go to college can't do entering freshman work, then how many people in the country are we preparing for next generation jobs? " asks Suzanne Morse, President of the Pew Partnership for Civic Change and author of Smart Communities: How Citizens and Local Leaders Can Use Strategic Thinking to Build a Brighter Future. If we keep investing time and dollars in what we've been doing over and over can we expect any different results? How do we get more people in business and industry personally connected to this issue? How can we create learning teams in companies and universities who connect directly with students and each other, and innovate new ways to use the internet and non-school hours (and non-school locations) to connect with kids and build aspirations and learning habits, starting in elementary school, that bring more kids through high school and into the jobs and career opportunities of the 21st century. One way is for companies to build a leadership strategy that encourage employees to get involved with schools and non-school tutoring and/or mentoring programs, as volunteers, leaders, talent and donors, not just in one or two programs, but in programs throughout a city. If a company does business in many cities, then encourage volunteer involvement in many cities. Then create workplace learning hubs, where volunteers involved in schools and non-school programs talk to each other, share ideas about what works and what could be working better. Use this to arm each volunteer with ideas, and resources, to have greater impact in the school or volunteer-based program where he/she is involved. Then mine this knowledge. Learn from what your volunteers are learning. Learn and innovate ways your company, or industry, can help these volunteers and these programs have a greater impact on student learning, aspirations, and workplace skills. Don't wait for someone else to take the lead. It's your company and your industry that needs these workers. This week's issue of Time Magazine, featuring McCain and Obama on the cover included a headline of "Second annual National Service Issue." One section of this issue offers "21 Ways To Serve America" - a list of quick and easy ways you can serve America, each written by important leaders in different sectors of society. One article focused on the role of colleges and universities. I encourage you to read this article, showing how universities might become strategically involved in supporting volunteer-based tutor/mentor programs as part of their own commitment to their neighboring communities, and to their diversity strategies. Chris Warren the 2008 Tutor/Mentor Connection Public Service Fellow from Northwestern University as written an informative article about the public service commitments of presidential candidates Barack Obama and John McCain. He also has written an article showing the benefits that companies and employees incurr when businesses encourage volunteers to become involved in tutor/mentor programs, as part of their own workforce development strategies. I've created a pdf titled "recruiting talent volunteers" which illustrates the benefits to non profit infrastructure if corporations were encouraging back-office talent, such as technology, human resources, marketing, training, to take roles that support non profit organizations. Furthermore, I use maps to illustrate a planning strategy that we hope hospitals, universities, churches and hospitals will use to encourage employee involvement in multiple locations where they do business, not just in one or two. Yesterday I attended a conference and had the opportunity to meet a Diversity Officer at American Airlines. He told how companies like Texaco and Coke incurred millions of dollars in legal expenses in past years because of diversity related law suites and how other companies face similar lawsuits today. I suggested to him that if a company had a volunteer-engagement strategy that encouraged employees to connect with inner city youth and volunteers from other companies throughout the city, rather than in one or two places. 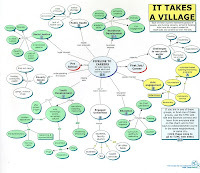 With such a strategy, they could demonstrate their diversity commitment by plotting locations in poverty and minority neighborhoods where they are involved, with maps similar to the one on this page which shows donations from the legal community to tutor/mentor programs in 2007. This is a visual illustration of a corporate strategy. It does not cost much to encourage this type of volunteer involvement. As Chris's article shows, there are many benefits to the company and its employees. If such a strategy helps a big company avoid a multi million dollar legal suite, that's just one more reason to invest in such a strategy. Read some of the other tags on "talent", "workforce" and "volunteerism" that are on the side of this blog to see more ideas on this topic. Of cource the biggest winner of all is the child who connects with a volunteer and a tutor/mentor program one year, and who is starting a job/career 10 or 20 years later because of the consistent mentoring, tutoring and adult support he received over this journey. We all win when this happens. I hope our leaders recognize this and provide the day to day encouragement that makes such programs happen in more places. Hurricanes, Floods, Economic Disasters. Politics. Is it time to give up? I've been leading a small non profit since 1990. 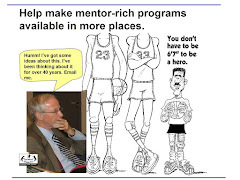 I've been leading a volunteer based tutor/mentor program since 1975. Every September for the past 33 years starts with recruitment of student and volunteers, orientation sessions, then the first night of tutoring, when kids meet volunteers for the first time, and many others renew bonds with the volunteer who worked with them last year, and maybe for several previous years. Read the Cabrini Blog and visit the Cabrini Connections web site to see how this tradition is unfolding for the 2008-09 school year. There's something else I've been doing every year since 1990. I've been looking for dollars to keep the doors open so kids and volunteers can connect. This has never been easy. Yet, this year, it seems that this is an even greater challenge. How can we ask for dollars from people who have lost their jobs, or their homes? How can we ask for donations when people are without electricity and living in motels because their homes are flooded? How can we compete with the star power and the importance of the Presidential election, when in one month Obama can raise over $30 million. When we run out of money do we just tell the kids and volunteers, we can't help them any more? Do we close our doors like so many small (and large) businesses are doing? In the articles on this blog and the Links Library at http://www.tutormentorconnection.org/ I've pointed to research and newspaper reports showing the impact of poverty on poorly performing schools, on the lives of youth and families, and on how this impacts the rest of us. A tutor/mentor program bridges the economic and social divide, by connecting volunteers from one slice of life with kids born in another. I can't give a list of evidence-based outcomes that result from what we do. I can just say that if we were not here for the past 15 years, more than 500 kids would never have connected with the 700 volunteers who have been here. I can also say that there would not be a Tutor/Mentor Connection, or a Program Locator database. Who maintains this information if we close the doors. How do parents, volunteers, teachers, etc. find out what organizations are offering tutoring and/or mentoring in their communities. Do we give up? No. Not yet. Instead, I encourage you to look at the maps being created in the http://mappingforjustice.blogspot.com/ site. For more than 10 years I've been trying to create a map capacity that leaders would use to draw attention to all of the areas of a city, or political district, where kids need extra help and where tutor/mentor programs can be part of that help. We've been rebuilding this capacity in 2008, thanks to a donation received in late 2007. I encourage you to read the articles at http://mappingforjustice.blogspot.com and on this blog, which illustrate how the maps might be used by anyone in a region, to mobilize volunteers, talent and dollars and to keep attention focused on a crisis, even when other more urgent issues dominate the headlines. If you know people who can support this process with their own donations, I'm appealing to you to ask for them to send us contributions to support this work. I won't give up. But, we need your help. We've had a poll on the blog for a few weeks, asking "Which Candidate Offers most support for tutor/mentor programs" and Senator Obama leads 17 to 5 in the voting. Do you agree? What sort of support do you think he'll offer? What should our next poll question ask? As we remember the past, and pray that it does not repeat in the future, my hope is that we find more people in this world who will adopt the "If it is to be, it is up to me" slogan that I borrowed from my friend Merri Dee of WGN TV when I first heard her speak in 1993. We can honor those who sacrifice by our own sacrifices to create a better world for our children, and for the children of those who live in distressed situations. If we don't find ways to put more than token time, talent and dollars into such efforts, the past will repeat, perhaps with even greater furry. I have written articles with this same theme over the past 3 years. If you search for the word "remember" in the search bar on this page you'll find those articles. I'm sure that many, many people are giving the same message today. 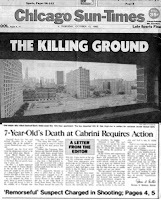 Last week I wrote about the 1992 shooting death of Dantrell Davis, and showed the front page of the October 15, 1992 Chicago SunTimes. Just like 9 /11, this is a daily reminder of the work that I need to do to try to create a better future for my own children and future grandchildren. I hope many of you feel the same way. Who are we trying to reach? Who is helping spread the word? I've had lots of people ask "who's your target audience"? Who are we trying to reach with the information on our web site? I point to this graphic to illustrate that I'm trying to reach anyone, and everyone, who is concerned about poverty, racism, social justice, workforce development, public health, education, and the democracy of America. So how do we reach these people? One way is through networking. I do this a lot. One strategy is to be part of blog exchanges. A few weeks ago, I posted a message about Brandywine Consulting and here is the message they wrote in their blog about what the Tutor/Mentor Connection. Sometimes I find it difficult to help people understand what I do. However, when other people explain it, as Brandywine Consulting does, my hope is that others will understand through the way they explan it. 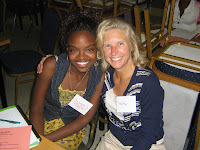 I ask the staff and volunteers at Cabrini Connections, Tutor/Mentor Connection, along with our interns, to write blogs for the same purpose. My hope is that our collective explanations and different perspectives, will help more people understand what we do, and why it is important for them to become involved. I hope you'll write about the Tutor/Mentor Connection and Cabrini Connections and pass on your understanding and commitment so others get involved because of your leadership, not because of what I do. If you are a tutor/mentor program leader, and you do not use a blog as part of your outreach and marketing, I encourage you to launch such a strategy, using the examples we point to via the Blog Exchange and other links. The front page of Sunday’s Chicago Tribune Metro section headline was “I see that Danny died in vain” referring to the October 13, 1992 murder of 7-year old Dantrell Davis, as he walked to school in Cabrini Green. The sub-head was “Latest child killings reflect ’92 Dantrell Davis tragedy”, and included photos of three Chicago kids killed in the last week. We started Cabrini Connections and the Tutor/Mentor Connection in the month following the shooting of Dantrell Davis. The Cabrini Connections part was an extension of a 2nd to 6th grade Cabrini-Green Tutoring Program that I had led since 1975. The Tutor/Mentor Connection was also something that had been growing for many years. From 1975 to 1992 as I lead the Montgomery Ward Cabrini Green Tutoring Program (which became Cabrini Green Tutoring Program, Inc. in 1990), I learned much from th leaders of a few other tutor/mentor programs operating in the Cabrini Green area, and the rest of the city. However, there was no master database showing all of the programs in the city, thus from an advertising perspective, there was no way the media could point resources to these programs when they were talking about "taking action" in their editorials. I recognized that whenever the media went into an editorial frenzy focusing on the killing of a youth like Dantrell Davis, they focused on the human tragedy of a single person, or a single neighborhood, just like Sunday’s story. While I was the volunteer leader of the Montgomery Ward tutoring program, I was also an advertising manager, developing weekly print ads that were distributed to 20 million people telling them about our 400 stores spread over 40 states. We used these ads to draw customers to all stores, not one or two. Nothing like this existed in Chicago in 1992 to draw volunteers and donors to tutor/mentor programs in all poverty neighborhoods on a weekly basis. In 1992 there was no master database showing what tutoring and/or mentoring programs were operating in Chicago, thus when the media did write a “do something” story, they often only pointed to a few brand name organizations, or a few high profile neighborhoods. 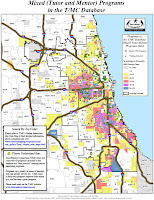 They did not point to a map like at the left, showing all of the poverty neighborhoods where good tutor/mentor programs are needed, or a Program Locator database that could be used by readers to find programs in every poverty neighborhood that they could support, or to find information to use to create programs in neighborhoods with poverty, but not enough youth services. In this timeline you can see the growth of Cabrini Connections, Tutor/Mentor Connection since 1992. More than 500 7th to 12th grade teens have participated in Cabrini Connections for since we started in January 1993 with 7 volunteers and five teens. More than 1000 different organizations have participated in Tutor/Mentor Leadership and Networking Conferences since we hosted the first one in May 1994. More than $2.5 million new dollars have been raised to support tutor/mentor programs by the Lawyers Lend A Hand Program, since we began working with them in 1994. We did not even know about the Internet in 1992, but were introduced to it by volunteers in 1998. Since then our web sites have provided information to more than 100,000 people. Since 2000 we've been documenting actions to achieve the goals of the Tutor/Mentor Connection. Yet, as the headline in yesterday’s Tribune suggested. “It’s not enough.” We must do more. Much more. We have been helped by many volunteers, and many donors, but we have never had more than a few month's rent in the bank, and after 1999 when our major sponsor Montgomery Ward went out of business, and 2000 and 2001 when the dot-com economy went bust, and the war on Terror began, we have had even fewer dollars to try to help tutor/mentor programs grow in all parts of the Chicago region. Yet we have not given up. We keep bringing out the front page of the October 15, 1992 Sun Times to remind our selves of the commitment we made, and to remind everyone else that if we want to end this inner-city terror we need to be spending quality time, talent and dollars on a regular basis, not just at random times when the media decide to bring this to our attention again. You can help us do this work by sending financial donations to help us do this work. Send them to Cabrini Connections, Tutor/Mentor Connection, 800 W. Huron, Chicago, Ill. 60642. Our FEIN is 36-3893431. See our financial reports on Guidestar. You can help by using the Zip Code Map to search for tutor/mentor programs in other areas, and picking one or two to offer time, talent and/or dollars. You can help by adopting the Role of Leaders, to engage your company, your church, college or social group in this war on poverty. You can help by passing this message on to someone else who also might help. Last night Senator McCain ended his speech with a call to service. Today I received email messages from Joe Bieden and Barack Obama, asking for $5 donations to support their campaigns. Earlier in the week with Gustav threatening to be a bigger disaster, I received an email from Obama encouraging me to send $10 to the Red Cross. Why can't both candidates make this a consistent part of their leadership? If you live in a huge city you're likely to read a story in the paper today or over the next few days about a poorly performing school, a youth being shot and killed, or some story about high school drop out rates and/or test scores. The Chicago SunTimes posted the fourth installment of its series on social and emotional learning, with a set of recommendations that would put more counselors and social workers in every school. This is much needed. 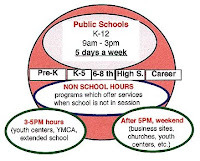 But why not also point to the non school hours, and to tutor/mentor programs that bring a wide range of adult mentors, role models, tutors and learning experiences into the lives of inner city kids? Such programs can supplement the mentoring that parents are able to do, and can help connect high poverty communities with a wider range of opportunities and resources. However, they don't operate without a cost. They need donations from business and philanthropy. Even from government. So when McCain talks of service, and Obama calls for citizen involvement, and donations, why not visit the Chicago Tutor/Mentor Program Links section of our web site and pick a tutor/mentor program to offer your financial support. Or take a look at the Zip Code map, and choose what section of the city you want to help. Then click the map, and see if there are any tutor/mentor programs in that area whom you'd want to help with time, talent or dollars. Or send a donation to the Tutor/Mentor Connection to help us maintain this library of information. When you support the T/MC, you're also providing a donation to help the Cabrini Connections tutor/mentor program, so your donation does double duty. We're at 800 W. Huron, Chicago, Il. 60642. Last weekend three more Chicago kids were killed in street violence. One of those was a close friend of Cassina Sanders who works at Cabrini Connections, Tutor/Mentor Connection. Read about this on Cassina's Spark Change blog. The editorial in today's SunTimes says "Everyone Should have Someone to Go to" referring to a social worker or counselor in a public school. The front page of the SunTimes said "It's time parents took a stand," referring to the parents who went to Winnetka to try to enroll kids in the schools the rich kids go to. Ron Brown's column in the SunTimes says "Meeks only telling half the story" as he points out that New Trier High School only gets 3% of its funding from the state, while Chicago Public Schools gets 35% from the state. New Trier only gets 1% from the Federal government, while CPS gets 17%. What Brown does not tell in his version of the story is that New Trier students are not dodging bullets every day, and most CPS students are not living in a community where are large percent of adults are college educated and working in a variety of high paying business and professional occupations. Then there are four full pages talking about the Republican Convention. I listened to the speeches last night, talking about the character of a man who survived five years in a prisoner of war camp and has spent 30 years in the Senate. In a conversation about generals, war and a commander in chief, I'd like to see just one person pointing to a web site with maps and blueprints that illustrated the complex problems facing inner city kids, and the expanded network of adults who need to be involved in helping these kids overcome the disadvantages of generations of poverty to have equal the opportunities of kids born into communities like Winnetka. One think that I'd like to point out was in the column written by Neil Steinberg in today's SunTimes. He wrote "without such a drama, these kids are too easily ignored by larger society." The event prompted on New Trier parent to say "she and other North Shore residents had formed a group to explore the issue of school funding inequities." I hope they also study the issues of poverty and violence that affect learning and how prepared kids are when they come to school every day. And I hope that next time Rev. Meeks does a march, he goes to LaGrange and other affluent areas South of Chicago, so that if groups begin to think about ways to help, they might think that as they come and go from home to work in downtown Chicago, they are passing through these neighborhoods, and they could be taking roles as tutors, mentors, leaders and donors, to help kids in the South part of the city be able to participate in programs like Cabrini Connections. The feature editorial in today's Chicago SunTimes is headlined with "Schools must confront root causes of violence". I added the (and communities) part because I don't think schools can solve this problem without strategic involvement of businesses, universities, faith groups, and others who live in regions of the city and suburbs where there is little or now poverty. 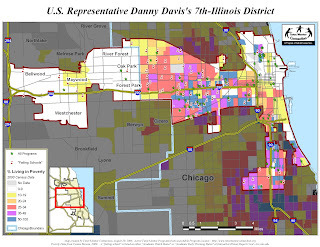 I use maps like this one of a congressional district to show how people from the West suburbs of the Chicago region pass through poverty neighborhoods every day as they take the Expressway, or the Metra Train, to and from work in the LOOP. With a little coaching many of these people could be leaders, volunteers and/or donors helping non-school tutor/mentor programs create social capital that expands the ability of people in high poverty communities to combat poverty. You can read how important these social and emotional supports are if you browse some of the white papers on the web site of the UCLA Center for Mental Health in Schools. However as you read that SunTimes articles this week, I encourage you to visit the 2006 report titled The Essential Supports for School Improvement, published by the Consortium on Chicago School Research. Read page 35, where the authors say "Increasingly, social capital is viewed as a critical element in combating poverty." Read how they define "Bridging Social Capital". They say "Bridging social capital accrues in disadvantaged communities as residents have opportunities to engage with external individuals and organizations. Bridging social capital permits job seekers in low-income communities to benefit, for example, from acquaintances with individuals outside of their community who can facilitate introduction to potential employers. Similarly, tutoring and mentoring programs organized by churches (or businesses) can bring middle class residents into extended relationships with their families." Take a look at the Cabrini Connections web site. Look at the diversity of different volunteers we show in the photos on the site. These people were connected with kids in the Cabrini Green neighborhood as a result of the actions of the people who created this organization, and who provide dollars for it to operate. Programs like Cabrini Connections are needed in many parts of the Chicago region. 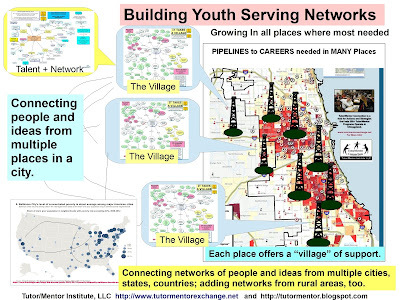 In the Chicago Program Links you can find web sites of many other organizations serving youth in other areas. Each of these needs volunteers and donors. Schools should not be held responsible for building and sustaining non-school tutor/mentor programs. This should be the role of businesses, churches, universities and philanthropy organizations. It takes a village to raise a child means everyone in the village should share some of the responsibility, not just the schools or the families. The strategy for supporting a network of such program is a marketing challenge, not an education or social service challenge. Who better to lead such strategies than our business schools, or volunteers from our Fortune 500 corporations. In today's Chicago Tribune I read an article about how the ex CEO of H&R Block left his $1 million corporate job to teach in inner city schools. During the May 2008 Tutor/Mentor Leadership and Networking Conference, one of the speakers was David Ginsburg, a former volunteer with Cabrini Connections, who now is an educator in a Philadelphia Charter School. Arthur Mollenhauer, Chief Executive Officer of Big Brothers/Big Sisters of Chicago left a 24 year career with Baxter, to become the current leader of BBBS Chicago. We need this to happen more often. That's the goal of the Tutor/Mentor Connection. If we can help more business people become involved in the lives of inner city kids, through an initial involvement in volunteer-based tutor/mentor programs, some will become leaders, who not only get directly involved as these men have, but who are able to draw resources from their business networks who will help support their work. This means that as school starts, there will be more leaders in business and philanthropy and media who are encouraging people to volunteer, or are encouraging people to provide dollars needed to support volunteer involvement, or build charter schools. Thank you Thomas, David, Art and others who have made this career choice.